Rebecca Pryor is a recent graduate of Pratt Institute’s Graduate Center for Planning and the Environment where she earned an M.S. in City and Regional Urban Planning. 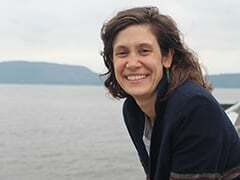 While earning her degree, Rebecca led environmental education and recreation programs with the Bronx River Alliance and North Brooklyn Community Boat House. She is the Program Coordinator with Riverkeeper and Guardians of Flushing Bay, rolling out their Flushing Waterways Vision Plan and coordinating the many voices of Flushing Waterways.